The Hazard River series by J.E. 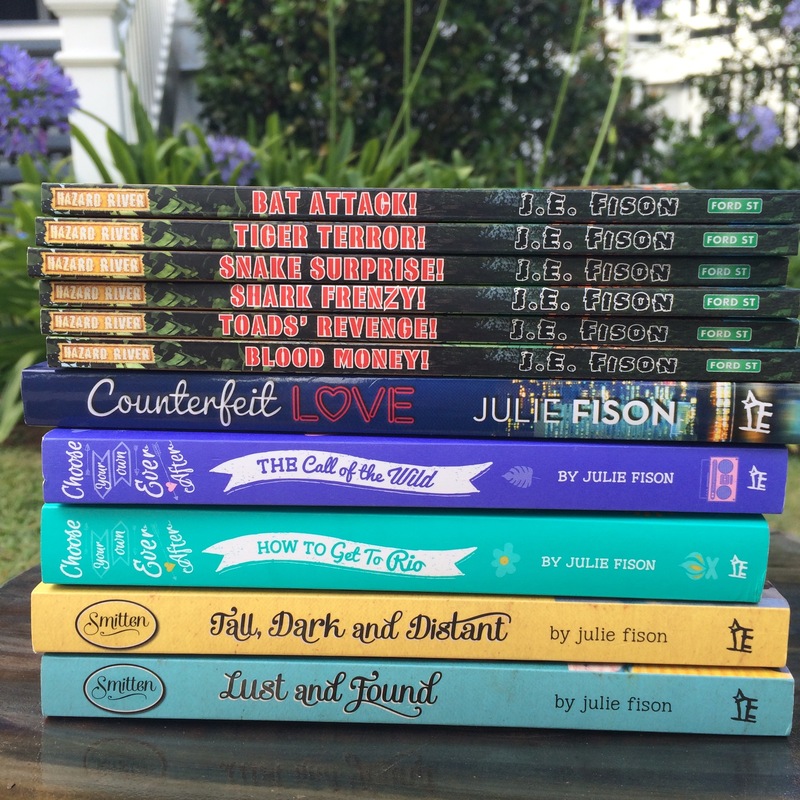 Fison (that’s me) is action-packed fun for young readers. Collect all six! 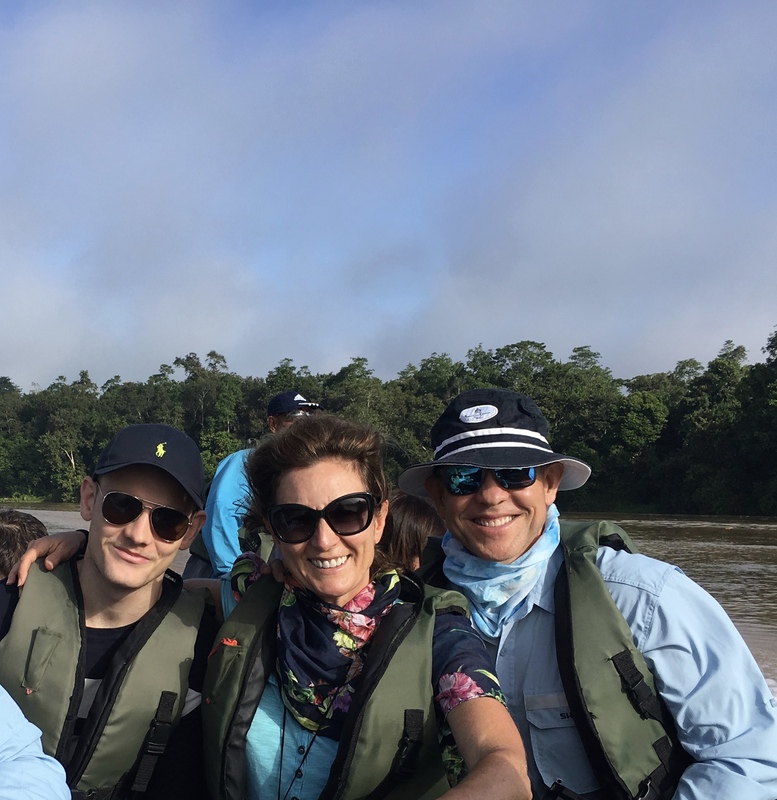 Holidays are normally fun – right? 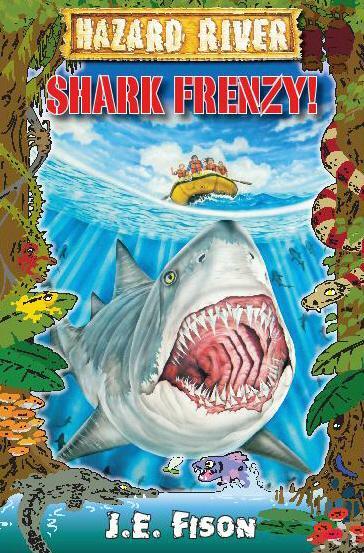 But when Jack Wilde, his brother Ben and their friends Lachlan and Mimi visit Hazard River nothing is normal. The gang comes up agaist rogue fishermen, smugglers and dodgy developers as they explore the River. How will they survive the summer? 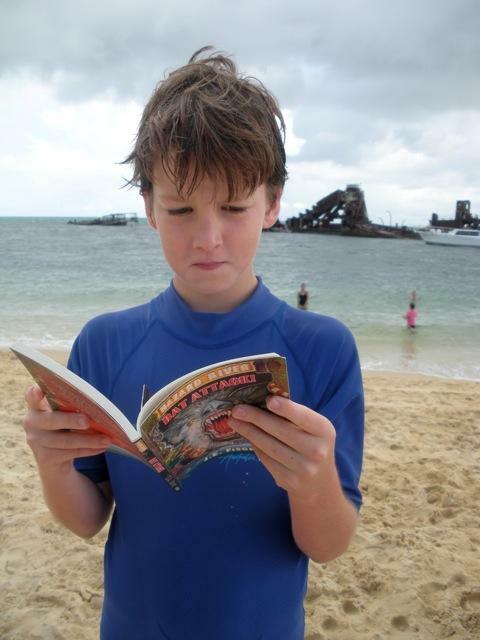 It’s a boring wet day on Hazard River until Jack Wilde and his friends find a note on an abandoned boat. The message is damaged but they can all read the words HELP ME. The gang must find out who needs help and why. But as they get closer to the answer, will they be the ones who need help? It’s New Year’s Eve and Jack Wilde and his friends are getting ready for a night of fun at the local disco. But when a mad driver almost runs them over, things start to go very badly wrong. Will New Year’s Eve be the best night of their lives or the very worst? As the clock ticks towards midnight, only time will tell. 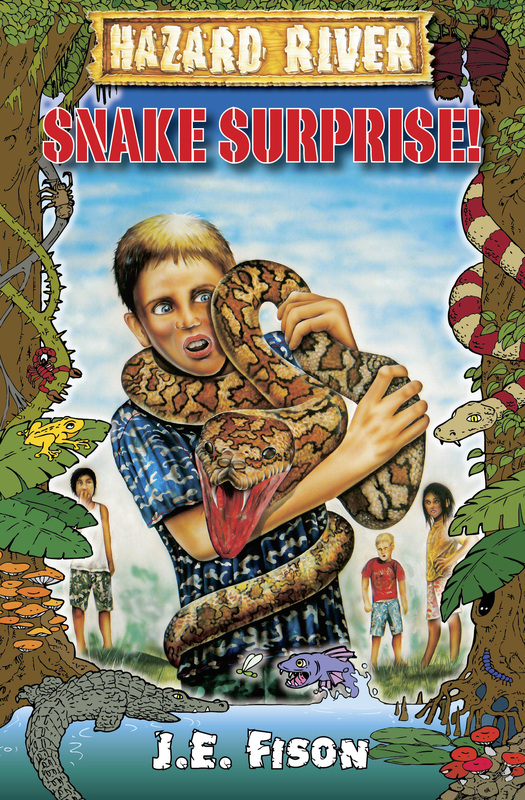 When Australia’s best-known adventurer moves to Hazard River, Jack, Ben, Mimi and Lachlan want to meet him. 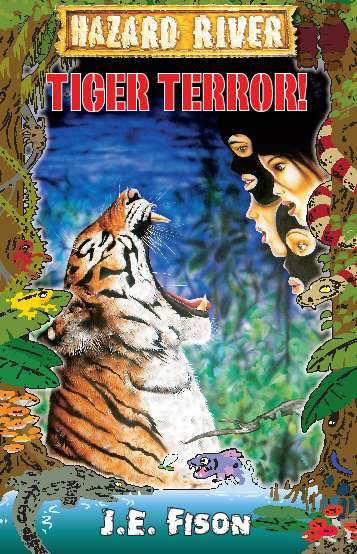 But instead of getting to know Just Orsum, the kids end up on his most dangerous and daring mission ever. Where will they end up, and more importantly how will they ever get back? The idea for the Hazard River series crept up on me during a family trip to the Noosa River. 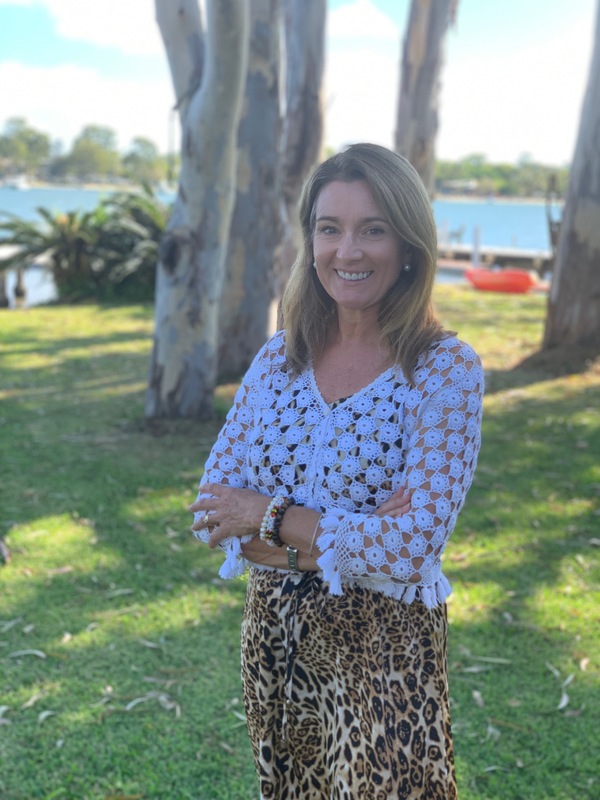 During the holiday my sons teamed up with friends and spent their days making camps, building rafts, jumping off jetties, avoiding snakes, dodging stingrays, exploring sandbanks and generally having a Boys Versus Wild adventure. I was inspired. 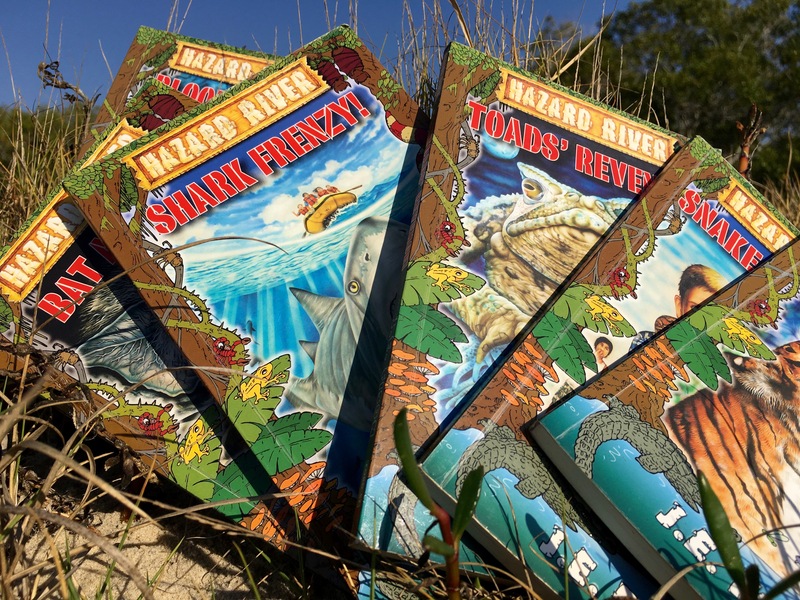 Hazard River is published by Ford Street Publishing and the covers are done by the very talented Marc McBride (of Deltora Quest fame). Summer holidays are meant to be fun, but at Hazard River danger lurks behind every tree. 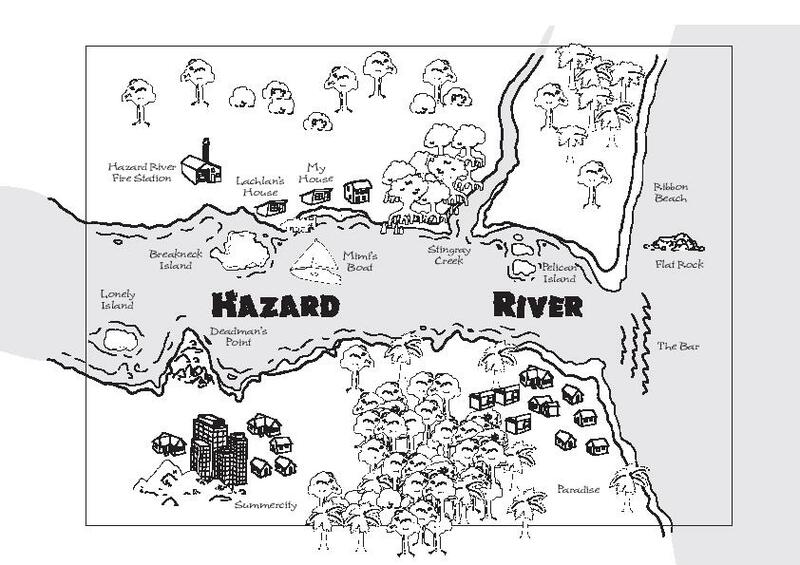 BUY THE HAZARD RIVER SERIES HERE. 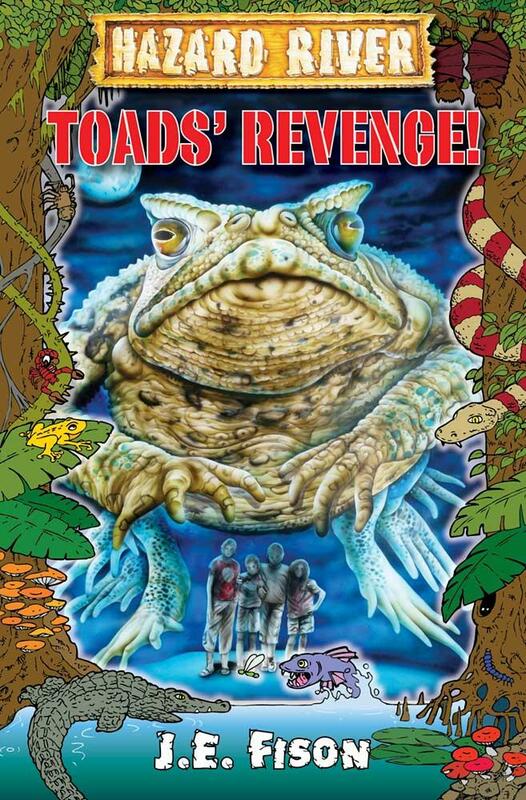 Toads’ Revenge: Jack Wilde, his brother Ben, and his friends Mimi and Lachlan find themselves in a freaky other world in Toads’ Revenge, when they accidently shoot themselves into the future. 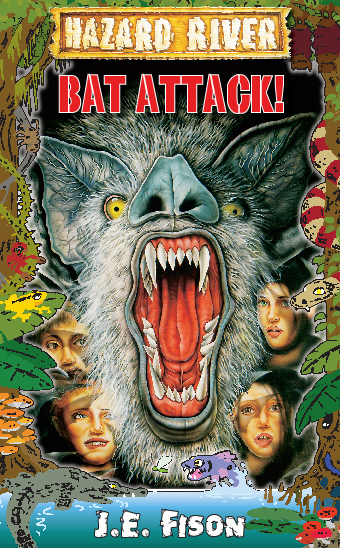 The kids face their most gruesome adversaries yet – giant mutant cane toads. 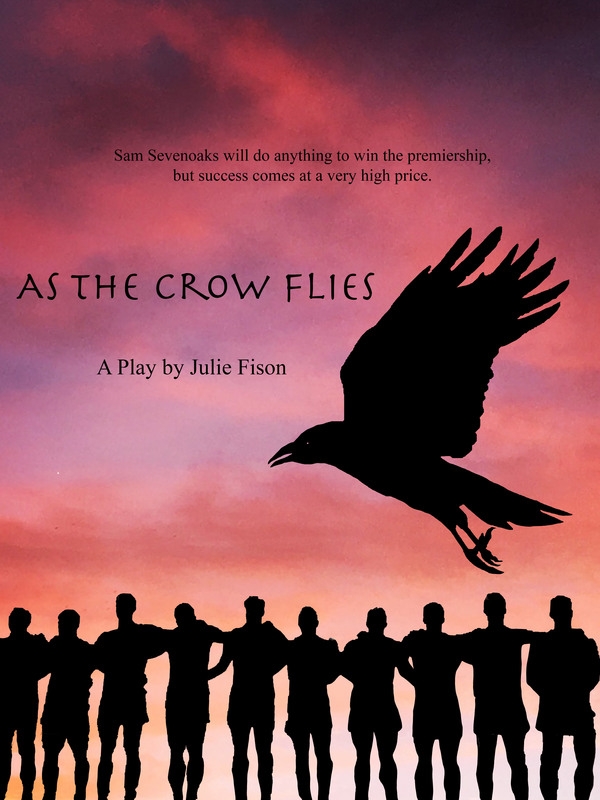 How will they overcome them and more importantly, how will they get home again? ‘Eenie, meenie, minie, mo . . .’ Ben says, pointing at the buttons as he chants the rhyme. ‘This one looks good,’ he says. He makes a random selection and pulls down a lever for good measure. The lights in the cinema go down and a nice woman, like a flight attendant, comes on the screen. She starts rattling off some safety instructions. It’s the usual stuff about seatbelts and emergencies. Just why you’d need that stuff to watch a movie is anyone’s guess. I completely ignore the seatbelt warning. I’m hardly listening at all, until the screen goes black. I wait for the movie to start, wondering what will come up. That’s when a countdown begins. ‘Ten…nine…eight…’ a serious voice says. ‘We have to get out!’ Mimi shouts, jumping out of her chair. She runs for the exit, banging at the control panel. The door doesn’t budge. The countdown continues. But I’m not relaxed. I’m getting nervous. I wish I hadn’t followed the Master of Disaster on another dumb mission. I jump out of my chair and help Mimi, mindlessly pushing buttons. The room starts spinning. Slowly at first, then faster. So fast that I’m hurled against a bare metal wall. Mimi is flung against the door beside me. Lachlan is ripped from his chair. I look around and find Ben. He’s spread-eagled against the television screen. His face is frozen in terror. We’re all trapped like flies on a piece of honey toast. ‘Enjoy your flight,’ the countdown voice says. In Blood Money, Jack Wilde thinks he’s made the big time when Ben discovers a bag full of money. Jack and Lachlan want to spend it, but Ben thinks it’s cursed and Mimi wants to take it to the police. The gang decides on some detective work to find out where the money has come from. But that’s when they really get into trouble! Ben scratches his head. He doesn’t say anything. I hope that is because he’s thinking. But he might just be deciding if green thongs are better than red ones. Who knows? I run through the mangroves until we reach a clearing. A big gum tree stands in the middle. A rope dangles from one of the branches. Dad tied it up there at the start of the holidays. I haven’t used it much, but Ben often comes here. It’s some kind of kangaroo graveyard. Ben likes to look for kangaroo bones. What can I say? It’s just something Stink Collectors do. I run to the swing and grab hold. I wrap my legs around the rope and swing towards the mangroves. I see something big and black. A sports bag is hanging by one handle. It’s on a low branch of a mangrove tree. The bag is bulging. It must be packed with money. I let go of the rope and fly through the air towards the mangroves. 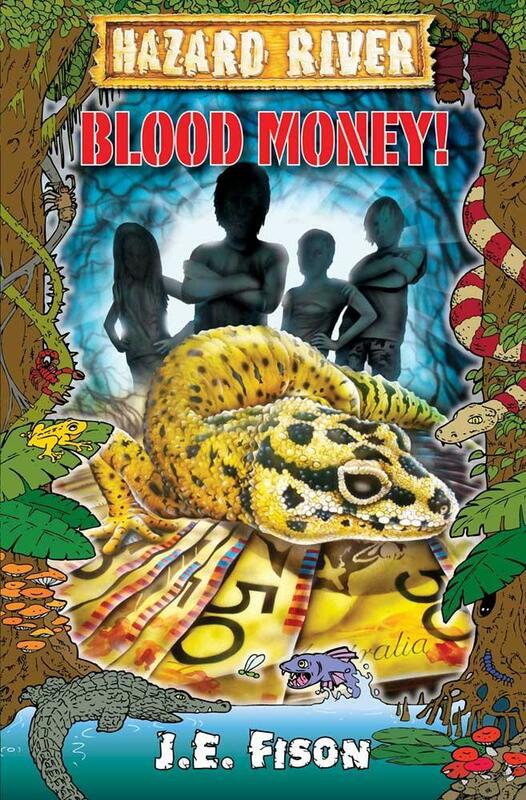 Blood Money is fiction, but it was inspired by a true story – a few years ago two brothers were fishing in a quiet creek in NSW and they found a plastic bag full of money – $100,000 in cash! The boys thought long and hard about what to do with it, but eventually handed it in to the police. Can writing fiction improve your parenting?